These qualities define the heart and soul of Motion Dynamics, which we formed, with the intention to supply virtually every individual or business in Australia with a range of high quality, low cost motion related products, that are readily available everywhere else in the world, except here in Australia! How often did we hear complains from our fellow hobbyists and engineers? How often did we read on public forums about the need to buy from overseas because of the high cost of goods? Based on feedback from friends and acquaintances, along with our own personal observations and experiences, we decided to start Motion Dynamics to address these issues, one step at a time. At one stage, we used to search for parts too, and we found Australian prices simply way too high! So we purchased goods from wherever it was cheaper to save money on our own projects. Sometimes we won with good quality and sometimes we lost with low quality. Ironic though, was that regardless of whether we won or lost, we still got the product shipped here, for a price less that what was available here! On the flip side, we understand just how expensive it can be to run a business here, with taxes and labor costing much more than in many other parts of the world. On top of that, catering to all business types isn't easy. The problem for most Australian business is that the product you buy passes through a few hands before it reaches you. Each one of those hands is asking for their share of the profit. So, to make things cheaper and more efficient, we remove all those hands and deal directly with the manufacturers and you. Most of the profit we make goes straight back into extending our product ranges and building our business, so we can continue to offer you more value for less money. All of the items we sell here, are guaranteed to be good quality, with a reasonable cost. This isn't a case of just finding the cheapest parts to palm out for quick profit. We can literally (and easily) point out the same products we sell, going for 50%-400% more on other websites or selling through other businesses! Every product we sell here at Motion Dynamics has been put through a destructive testing processes. The product goes through the most heavy duty abuse that we think the unit will ever see over the period of its service life. Often, after a product passes it's accelerated life tests, we'll actually try and break the product, either by overloading it or using the product in ways it was never designed for. If it breaks or fails in some way, we'll look at the what went wrong and either suggest changes to the manufacturer or we'll find another supplier. Sometimes the testing can take more than a few months, especially if its heavy duty or needs a longer cycle times to properly test, and even longer if we manage to break it because then we're back to square one. So, as you might imagine, it takes a while for new products to appear on our pages. Once the product passes, it's placed on the web site and you can feel comfortable knowing that you are getting a good product that we had a lot of trouble breaking. Other times we'll buy a product based solely on it's reputation. For example, if the product has been in the marketplace for a long time and is for sale by lots of sellers then you can usually find WebPages dedicated to modification, feedback and customer experiences on the product. We don't do much testing on these kind of products, because from all the information that is usually available it's easy to make a decision based on the experiences of others. We do get lots of praise for the quality of our goods, with some customers telling us that our products are better than more expensive units from other companies. Hearing this is a damn good feeling, we can tell you that. What's blatantly obvious to us, is that it's much cheaper and more profitable to sell better quality gear than it is to sell cheaper goods. Why? Look at it like this. You never know how a customer will use a unit. Some people contact us with some ideas that are way out there, and we know that what they want the goods for was probably not even remotely considered by the original designer of the product. So, If we sold the cheap product, and it breaks, we have to replace it under warranty and then have the costs associated with the return of the goods, the replacement of the goods and the return shipping for the goods! But, if we buy the better gear from the start, it doesn't break. The customer is much happier and we save money and time. Simple. 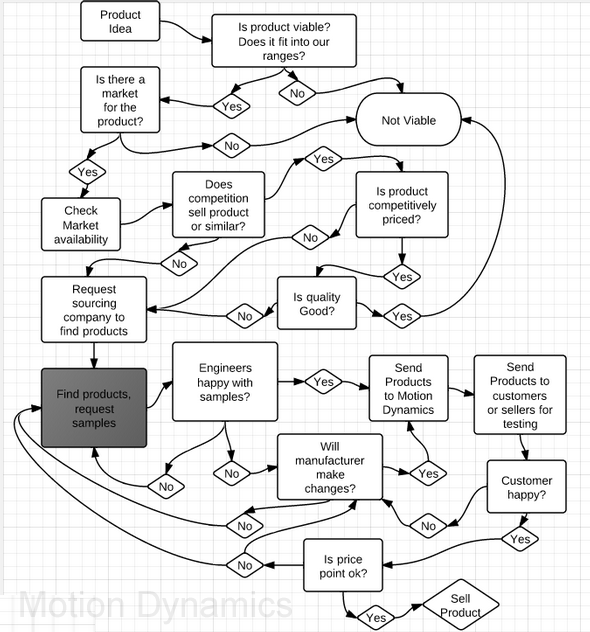 To get an idea of the process, take a look at our flow chart we tend to live by these days. It's an involved process isn't it? The time frame from when decide we actually want a product, to having it on the webpage available for sale can be up to 6-8 months. Most of the time is taken up with the actual testing of the units. We sell AC and DC motion products to retail, wholesale and trade sectors of the electric motor Industry across Australia and more recently, Internationally. We support Australian trade and motor resellers with discount pricing on some products, and can also supply OEM and bulk quantities for recurrent or one off orders when required with respectable lead times! If your company is after a custom product with low quantities, feel free to talk to one of our sales people. Our specialty is the replacement of Oriental Motors (specifically, the World K Series), meaning we can replace all the copies of this motor from well known brands such as SPG Electric motors, Sesame, Panasonic to the budget Chinese brands such as Dongzheng, ZD (Zhongda) Lixing(LX) Honlite and more! Our product ranges consist of AC and DC Gear Motors, Speed Controllers DC/AC, Planetary Gear Motors, Worm Drive motors, E-Bike motors, Linear actuators with more products being added monthly! We run lean. There's no fancy office, warehouse and minimal staff! We don't drive new cars, and we diversify as much as we can to save money to keep prices low. We avoid buying cheap products, instead sourcing only from the better manufacturers. Sure, we might pay more than others do, but we get good quality products that we can offer at great prices as a direct result of our low overheads. Why should you pay all our expenses? It helps too, that we also have access to a vast array of professional services, like quarterly International freight to Australia, Web Design Professionals and business and marketing advisors who constantly instruct us on the most efficient ways to operate and who set our prices based on the current exchange rate to always be favourable to customers! We don't troll overseas manufacturer directories for products like our competition does, and we don't just buy goods and pray everything will be ok.
We use dedicated engineers under our employ, who source the products for us throughout Taiwan, Hong Kong and Chinese factories, who test and then send us samples from who they consider to be the better manufacturers, based on the factory and product reputation, availability of stock, inspection of the goods and overall reliability. Once we receive the samples, we perform our own testing and inspections, often sending samples to customers who we know will test the goods thoroughly in their own projects or to clubs for more field testing to be performed. If we can, we'll make any changes required based on the feedback we receive to increase the quality of components or even add features we think may be useful and only then will we purchase in quantity. After that point, we use the same team to make sure the manufacturer sticks to the exact specifications we expect, so there's never any discrepancy between the samples we approved and the products that arrive at your door. All of our DC Speed controllers are designed in house! How do we choose the items we import? factors to decide whether or not there may be a market for them. We basically buy the gear that interests us. On top of that, often customers who ring or email us will ask if we sell such and such product, so we make a list of the things that customers ask for but we don't have. Trust us when we say there's always plenty of new products in the pipeline. Our engineers are kept busy full time chasing around for the various bits and pieces we ask them to hunt down for us. Eventually they'll appear on the website! We are constantly expanding our product lines to give you more of the products that you ask for!